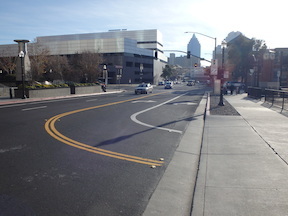 The bike route allows bi-directional travel along N Street, which would otherwise not be possible. 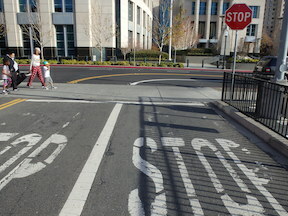 The city has recognized that N Street is a significant barrier to east-west bicycling. 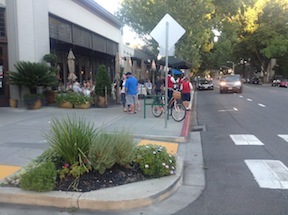 With this post, I’ve added a new category to my blog: re-gridding Sacramento. I’ll have more to say about that category, and many more posts, in the near future. Let’s say one was driving and wanted to leave the Sacramento Valley Station (Amtrak and Capitol Corridor) to head southbound or eastbound. Tough luck. The exit at the east end of the parking lot forces you to turn right, to the south, onto 5th Street. I often see people turning across the double yellow line to go northbound on 5th Street, and to be honest, I don’t blame them, because this is the logical though illegal way to go south or east. I walk a lot in midtown, going to and from various destinations such as the train station, nonprofits and agencies I work with, grocery stores, theatres, farmers markets, breweries, etc. I was thinking last night as I walked to and from Capital Stage about what streets I choose to walk on. Almost all the time I choose to walk on two-way, two-lane streets. I rarely choose to walk on the multi-lane streets and the one-way streets, except for short distances as I zigzag to my destination. The two-way, two-lane streets are usually quieter, less traffic and traffic moving more slowly. I can relax more with the quiet, and I can look around more, paying more attention to everything around me and not just traffic.